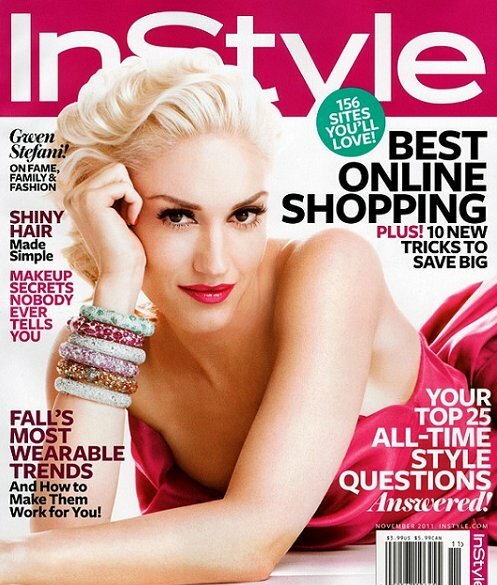 Singer and Fashion Designer Gwen Stefani graces the cover of InStyle magazine's November 2011 issue. Read on to see more photos of Gwen's fab style and our favorite look from her photo-shoot as she rocks designs by Giorgrio Armani and Jimmy Choo. Our Favorite Look: Giorgio Armani beaded jacket and Jimmy Choo suede sandals with feathers. Marchesa dress and Lorraine Schwartz bangles. Diane Von Furstenberg gown, Van Cleef & Arpels necklace, MCL by Matthew Campbell Laurenza bracelets. What do you think of Gwen Stefani's InStyle photos? Leave a comment below. Luv her blue eye liner. I loved her in No Doubt why isn't she making music? I like her B/W photo best reminds me of madonna and marilyn. Great information to my mind. Thnx for providing that info.